It’s hard to say exactly when I learned how to steal music. At first, I think it happened when I learned how to torrent. Then I recall my late nights with Napster. But if I really think hard about it, I remember middle school and Columbia House and that incredible eight CDs for a penny deal. That’s when I started stealing. Columbia House, the company, just filed for bankruptcy. I know what you’re thinking: That shady mail order music business is still around? That vestige of the pre-internet music sales may feel like a moldy relic, but the Columbia House Music Club hung on long past the CD’s prime. It closed in 2010 after an incredible five-and-a-half decades of peddling records for unheard-of prices. As streaming music services stormed into the mainstream over the past five years, the company struggled to come up with an offering of its own, and sustained itself on a dodgy DVD club. Nevertheless, the legacy of Columbia House will last a generation. My family didn’t have a lot of money growing up. If I wanted to buy a CD at full price, I’d have to work for it, mowing the lawn or washing dishes in my parents’ restaurant. Looking back, it was a great way to learn about how the world works. At the time, though, I was frustrated when it took a half day’s work just to earn enough cash for one album. That’s why I flocked to the Columbia House music club. The deals varied, but I knew that I could easily acquire a stack of CDs with little or no cash up front. I figured that I could get out of the commitment to buy more since I was a minor. It all seemed too good to be true. Columbia House taught me and my peers that music didn’t need to be expensive. It could even be free if you knew how to game the system. Already a voracious music lover by my pre-teens, I gobbled up the seemingly free CDs as often as possible. The deal was, you’d sign up for a music club membership and get eight CDs for the low, low price of a friggin’ penny. Once you received that sweet intro offer, you just had to cancel the membership to avoid getting charged for the obligatory monthly purchase. You could even sign up multiple times using different names and credit cards. How could I not cash in on this bargain? Back in the 90s, Columbia House’s text-heavy ad for cheap music followed me wherever I went, hiding in the backs of magazines and tucked into stacks of junk mail. Without telling my parents, I’d fill out the cards, selecting all of the hot pop favorites—MC Hammer, TLC, Alanis Morissette, 311, Sublime—and wait patiently. A few weeks later the records would arrive, and I’d start to scheme. Before long, I got bored with the selection at Columbia House. I also tried its competitor BMG, but the selection was largely the same. (Columbia House and BMG later merged.) So like any enterprising teen with questionable morals, I figured out how to take the free CDs to the local record store and exchange it for what I really wanted. Columbia House burned me a few times, since it would sometimes press its own branded copies of albums in order to squeeze out a better profit margin. But mostly, I got away with it and built a nice little library of late 90s alternative rock music. Meanwhile, Columbia House raked in cash regardless of adolescent scammers, with its parent company claiming $1.4 billion in revenue in 1996. It seemed like everyone was a winner. I taught my friends the tricks of the trade, and by the time we were finishing up middle school, we were packing thick Caselogic CD wallets at all the pool parties. By the time we bought CD burners, we were DJing dance parties. I discovered Napster not long after it launched in 1999. By that time, I’d been a serial Columbia House member for a few years and built up a massive library of ludicrously cheap music. I’d gotten a little bit greedy, I’ll admit. I used my family members’ names to set up extra accounts for my siblings and my parents. But the free ride couldn’t last forever. Eventually, the music club bills turned to collection notices, and I had to pay up. In the end, I paid a few hundred bucks for my various music club memberships. I also dodged a few hundred dollars more in charges, by writing letters and complaining about terms. Nevertheless, I know that the Columbia House model helped me acquire a fuckton of music. If you take trading with friends into account, I’d say that my CD library was worth a few thousand dollars by the time I first logged on to Napster. In its first two years of operation, I spent countless hours on Napster, uploading my scammed tracks from Columbia House and downloading whatever I wanted. I’m conflicted about all this. File sharing didn’t feel like stealing. It felt like sharing. After all, I’d worked hard to acquire my massive music collection, and I was offering any random Napster user access in exchange for something from their library. When the record companies brought Napster down, I found new ways to share. Through the early aughts, I bounced around on services like Kazaa and Limewire before settling on BitTorrent and the Pirate Bay. By the time I finished college, I had at least a terabyte worth of music and movies, the vast majority of which I’d downloaded for free. Yet, I paid plenty to go to concerts and movie theaters. It felt like a tradeoff. It’s strange to admit being complicit in a scam. On one hand, it felt right at the time. On the other hand, it seems rather shameful in retrospect. I’d be lying if I said my music hoarding was a guilt-free endeavor. From the early Columbia House album days to the long nights torrenting entire discographies, I’ve felt a little bit awful every stop of the way. I was hardly the only one doing this. In 2000, a New Jersey man plead guilty to fraud charges related to his mail order music club addiction. This twisted hero managed to receive nearly 27,000 CDs by setting up some 2,400 accounts with various clubs, sending his spoils to over a dozen addresses. The accomplishment would be impressive if it weren’t so insane. But this is the kind of culture that Columbia House encouraged. Eight CDs for a penny was too good to be true, and yet, you could do it. The so-called “negative option cycle” that the business model utilized is actually illegal in 15 states and some foreign countries now. The term refers to the practice of luring customers into a club with “free” gifts and then charging them—often high fees—if they fail to cancel their membership. Companies like Columbia House inevitably made money on people that weren’t paying attention to their bills, not unlike AOL and its revenue from dialup customers. Inevitably, I learned the hard way that these music clubs would find a way to squeeze money out of you no matter what. It’s somehow fitting that free file-sharing spelled the downfall of the seemingly free music era of Columbia House. Services like Napster simply made it easy to get the music without shady membership strings and collection agencies attached. These days, I pay for my music and movies. I’m not a teenager any more, and streaming is wonderfully convenient. In fact, I spend more money now on streaming movies and music than ever before. It’s worth it, too: Spending more than a few pennies doesn’t leave me with the uneasy feeling that my career as a music scammer did. Nevertheless, I can’t shake the idea that I scammed my way into a dependency on easy access to music and, later, movies. It almost seems like the entertainment industry pulled off one hell of a long con by enabling us all to become addicted to content. 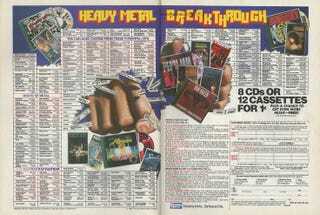 Columbia House taught me that I could get what I want without paying for it. Napster and friends made it easier. Now, I want it all—and I can have it, too. It’s the American dream, really.